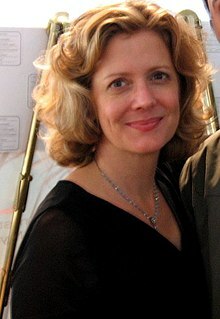 Kristine Sutherland (born Kristine Young; April 17, 1955) is an American actress best known for her starring role as Buffy Summers' mother Joyce Summers on the television series Buffy the Vampire Slayer, where she appeared in every season, and her role as Mae Thompson in Honey, I Shrunk the Kids (1989). She was born Kristine Young in Boise, Idaho, and changed her name because she was often confused with another similarly named actress. The last name "Sutherland" was after her cat, whom she named "Donald" after Donald Sutherland, who, coincidentally, had a role in the original Buffy the Vampire Slayer film, Joss Whedon's first attempt to bring Buffy to audiences. She is not related to Donald Sutherland or his son Kiefer. She attended high school in Lexington, Kentucky, where she participated in the Tates Creek Drama program. After graduating, she enrolled in the University of Kentucky. Sutherland's first film role was as a secretary in Legal Eagles (1986). She appeared as Mae Thompson in the 1989 film Honey, I Shrunk the Kids. Her career received a big boost when she played Buffy's mother in the action-horror television series Buffy the Vampire Slayer, from 1997 to 2002. Creator Joss Whedon later stated that one of the reasons he chose Sutherland for the role was the fact that she exuded a warm demeanor, as well as what he believed to be a close resemblance to actress Sarah Michelle Gellar, who was to portray her daughter in the series. She appeared regularly on the show for the first five seasons before leaving, but returned for three more guest appearances, 1 in season 6 and 2 in season 7. After leaving Buffy, Sutherland attended a photography course at the Santa Monica College and subsequently set up a studio specializing in portraits. In 2008, she appeared in the television miniseries Comanche Moon and had a guest role in an episode of New Amsterdam. She voiced Haru's Mother in the English dub of The Cat Returns. Sutherland is married to actor John Pankow. They have one daughter. 1984 Hot Pursuit Episode: "Portrait of a Lady Killer"
1984 Remington Steel Pamela Jones Episode: "Let's Steel a Plot"
1994 California Dreams Ariel Lange Episode: "Daddy's Girl"
2002 Providence Joyce Moore Episode: "Things Have Changed"
2008 New Amsterdam Didi Gleason Episode: "Reclassified"
2013 The Following Parker's Mother Episode: "The Fall"
^ a b "Kristine Sutherland". Retrieved 3 December 2014. This page was last edited on 17 March 2019, at 00:02 (UTC).